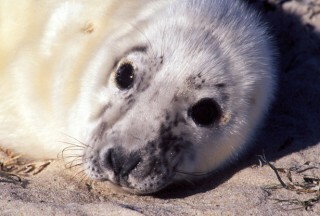 Gray Seal Pup off Maine, USA. We are interested in speaking to companies that would like to get involved in the underwriting of Jonathan Bird's Blue World. If your company would like to provide financial backing in exchange for incredible exposure on public television, please contact us. Jonathan Bird's Blue World currently airs in more than 72% of U.S. Households on public television and is widely watched worldwide on the internet. Previous sponsors include Ian's Natural Foods and the Guy Harvey Ocean Foundation. We are also partially funded by the National Science Foundation. Drop us a line, you may be surprised how effective and inexpensive sponsorship can be.